Construction is well underway at the Concord Apartments, Jimmac’s exciting new mixed-use development in Stuart Street, in the heart of Bulimba’s Oxford Street precinct. 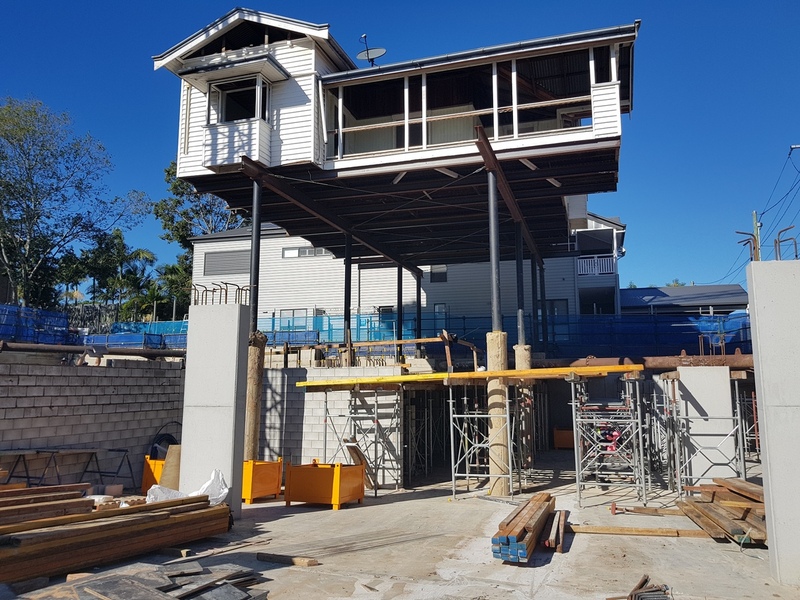 The site was previously occupied by a highset Queenslander that was required to be retained on the site and is being renovated as part of the new development. One of the challenges for builders, Constructions Group, and Morgan Consulting Engineers, was to allow the excavation and construction of the basement carpark, which is built from boundary to boundary, directly below the original house. In a complex multi-stage process, the house was moved onto a series of sacrificial cantilever CFA piles and steel posts, suspending it well above ground level to allow excavation and construction of the basement and entry ramps. Using the temporary house removalists support beams for vertical support and the CFA basement retention piles for bracing and stability the house is now safely suspended over the worksite. With an impressive 10m total “stump” height, this soon to be beautiful old Queenslander sits dominant over the site while work goes on around and below. The ground floor, which acts as the foundation for the house, will be poured and the sacrificial piles and posts will be removed. The house will then be lowered into its final position, ready for the renovations.